Tuesday, October 30, 2018 – Insilico Medicine, a Rockville-based company developing the end-to-end drug discovery pipeline utilizing the next generation artificial intelligence, will present its research in AI for drug discovery at BioCentury China HealthCare Summit in Shanghai, 13-14 of November. Artificial Intelligence (AI) techniques, such as deep learning (DL), reinforcement learning (RL), and generative adversarial networks (GANs) play a pivotal role in studying the biology of aging and disease on many levels. Alex Zhavoronkov, PhD will present Insilico's latest results in the generation of novel small molecule leads using the Generative Adversarial Networks and Reinforcement Learning, as well as the multi-modal biomarkers of human aging and age-related diseases. "I am very happy to present at BioCentury China, one of the main platforms for the biotechnology industry. China is rapidly gaining prominence in artificial intelligence for drug discovery and has the potential to reinvent the pharmaceutical industry and healthcare in general. 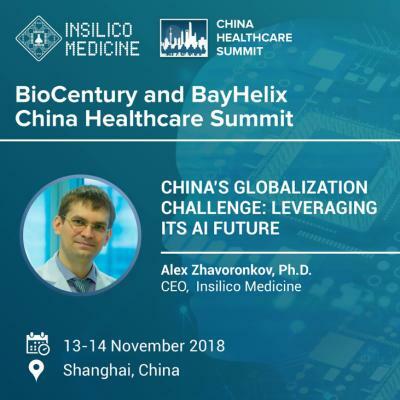 Insilico Medicine is committed to developing the most advanced AI solutions in China and becoming a partner of choice for the next-generation pharmaceutical companies", says Alex Zhavoronkov, Ph.D., Founder, and CEO of Insilico Medicine, Inc.
5th BioCentury-BayHelix China Healthcare Summit brings together the biopharmaceutical community and life sciences executives to get a first-hand look at the innovation, business and policy transformations taking place in China. The Summit is held on 13-14 of November. Insilico Medicine is regularly publishing research papers in peer-reviewed journals. The company was first to apply the generative adversarial networks (GANs) to the generation of the new molecular structures with the specified parameters and published a seminal peer-reviewed paper submitted in June 2016. The concept was further extended and augmented with advanced memory and reinforcement learning. One of the latest papers published in the Journals of Gerontology demonstrated the application of the deep neural networks to assessing the biological age of the patients. The latest special issue in Molecular Pharmaceutics featured several research papers by Insilico Medicine.